Wisdom of Life. : How do you reach your boiling point!! I was brought up in a typical Chinese coffee shop of the past. Today they re brand the unpopular coffee shop to another name, they called as Kompitam which could be seen every corner of our cities. They served tasteful coffee and Hainanese tea for the locals. As i was slipping my tea with some friends at one of the kompitam, i asked whether they had tried tea or coffee, with water boiled from charcoal. Yes! They hadn't. They had not experienced the old days when old & gas were not available then, we had to depend on wood & charcoal for fuel. Next, I asked another interesting question! What is the different between water boiled with charcoal and gas? Meaning two separate pots of water, one to be boiled by charcoal and the other one by gas, both boiled until reaching boiling point. Surprised me, non of these so called tea and coffee drinkers no the differences. Though i am not a chemist or scientist, i learned from observation and curiosity, i explained the facts to these innocents. Water that is boiled with gas, reaches boiling point faster than with charcoal. However the hotness and temperature of water boiled with gas, cools down faster than water boiled with charcoal. Meaning water heated by charcoal retains the hotness longer than with gas. Water boiled with charcoal tastes better and fresher than with gas. 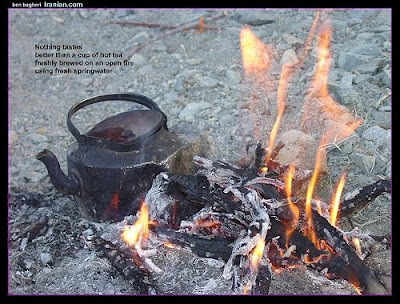 A cup of coffee or tea, with water heated from charcoal is always served tastier and hot all the time. Don't believe me, you can try it at home. 'Gas' is like those who fall in love at the first sight. They get heated up fast, wild and crazy with their partners. At the same time, their desire and feeling diminishes very fast as well, when they are very bored with each other. 'Charcoal' is different. They fall in love slowly and surely. They take their own sweet time to understand one another. Once they get heated up, they will never fall apart. I behaved like a 'gas lover' when i was young. Not now any longer! I am a 'charcoal lover' who believe in ever lasting love at peak point all the time until infinity. What are you, gas or charcoal lover? Food for the heart - "The hunger for love is much more difficult to remove than the hunger for bread" - Mother Teresa. I have tasted the "gas" coffee,it was nice, I can just imagine how the "charcoal" coffee taste...anyway...I can develop "charcoal" love, more sweeter more relaxed. Thank you bro for reminding.